Total retail sales this holiday season will grow a moderate 3.1% over last year as retailers continue to experience heavy discounting during the core holiday shopping months of November and December, according to eMarketer’s latest report on the matter. U.S. retail ecommerce sales, meanwhile, are expected to jump 16.6% during the 2017 holiday season, driven by the intensifying online battle between large retailers and digital marketplaces. eMarketer estimates that in 2017, holiday sales will total $923.15 billion, representing 18.4% of U.S. retail sales for the year, a 0.1 percentage point drop from 2016. eMarketer also expects retail sales to grow 3.8% during 2017 overall, up from 2.9% in 2016. Unemployment remains low at 4.4%, and economic confidence is high, according to the Conference Board Consumer Confidence Index, with a level of 121 in July 2017. By contrast, the Confidence Index stood at 97 in July 2016, before edging up to 109 in November 2016 and 114 in December 2016. Although retail in general will have a slightly slower year compared with 2016, ecommerce sales growth is expected to accelerate for this year’s holiday season, reaching 16.6%, compared with 14.3% in 2016. 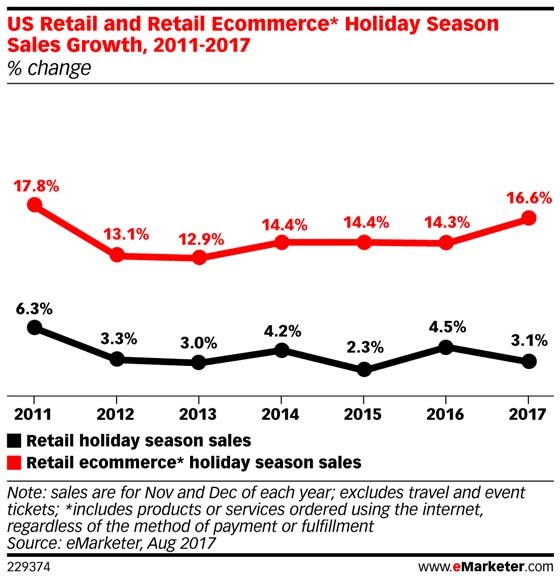 This rapid growth, along with the moderate growth in total retail, will push up ecommerce’s share of total holiday season sales to 11.5%. Additionally, November and December will account for 23.6% of full-year ecommerce sales. For the year, eMarketer expects to see 15.8% growth in retail ecommerce sales, with increases across all product areas. Ecommerce will account for 9% of total retail sales in 2017, according to eMarketer’s counts.